I use to think I knew a whole lot about beauty, even for a tomboy. Even for not wearing much or doing much in the way of beauty. Since I have started reviewing products for Tomoson I have learned a lot. One of the things I learned was that I didn't really know anything about beauty or beauty products. The second thing I learned was what a serum is and what it does. Basically, a serum is a clear thick liquid that is applied to the face and neck. It helps with wrinkles, fine lines and dark spots. Some people even use serums to treat acne and to brighten their skin. Sometimes they have a smell and sometimes they don't. When there is a smell, it is usually a citrus-ish smell. 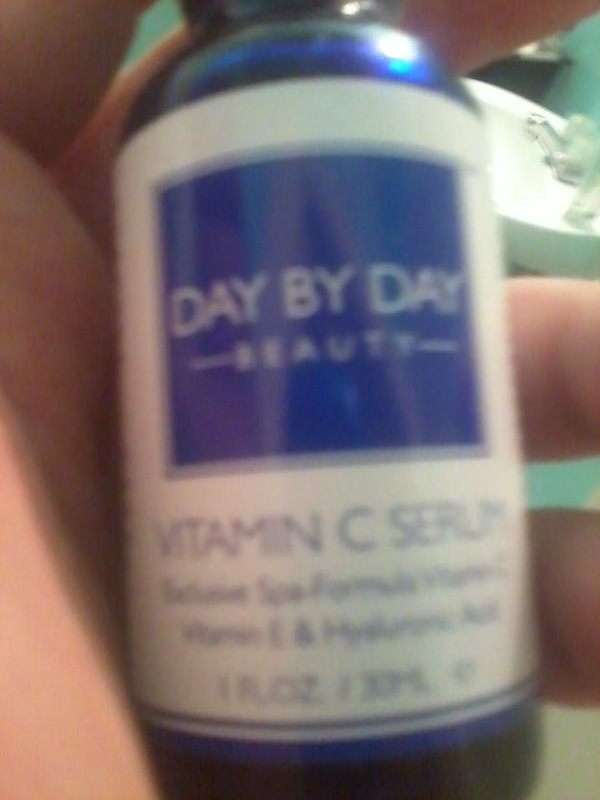 Day by Day Vitamin C serum comes in a very attractive blue bottle and it is a very good size but not too big. Which is a good thing because if serums are left for too long in the bottle and not used they can become harmful to the skin. If you have ever used a serum before, you know how to use them but if you haven't, it is pretty easy to understand and remember. Simply spray it into the palm of your hand. From there, put dots all over your face with it and then rub it into our face and neck. I really like the fact that this has a spray top and not the usual dropper. Although it was more of a hassle getting enough into the palm of my hand, it was easier and cleaner then taking out the dropper every time I wanted to use the product. It didn't make me break out or cause my skin to burn in anyway either. If you want to brighten and tighten your skin, this product is definitely something that you will want to try. If you want to check it out, go to their Amazon page by clicking here. It is always a good thing to check out other reviews and see what they think about the product as well. As with anything, there are mixed reviews but most of them are 5 stars reviews. As with anything, you never know until you try. :) http://www.amazon.com/Best-Vitamin-Serum-Beautifies-Face/dp/B00GCQMSVA Also Check out their website http://daybydaybeauty.com.